The other day while I was at the dentist's office I had the misfortune to catch Jenny McCarthy and Holly Robinson Pete's interview with Larry King. They also had a so called autism doctor, one Jerry Kartzinel, join them. After seeing most of the interview I understand now why everyone is so irate over Jenny McCarthy's recent surfacing as an autism mom. I'm still contemplating a longer post about Jenny McCarthy's opinions on autism but there are two things that really stuck for me in the Larry King interview. Another fun with science edition. In response to Jenny McCarthy making the rounds of media outlets to promote he new book about her experiences with and opinions about her son's autism Autism Diva has posted some fascinating information about vision and the human brain. She says some stuff about Jenny McCarthy too which you can peruse at your leisure. A brightly lit room with a dimmer switch at night time. A mirror, the bigger the better. Any corrective eye gear you normally wear. I got a jury duty summons in the mail today. Finally I get to exercise my civic duty! The last time I was sent any information about serving on a jury the boys were still toddlers so they let me off the hook. I as a bit bummed about that but seeing as there's no juror's day care at the court house I really wasn't in a position to serve. Now that the boys are in school and Sophia is much less of a hand full than either of them were at her age (almost 3 no) I'm ready to give this whole jury duty thing a try. Scary ain't it? I can still be generally thankful even though I can't remember the specifics of what I want to be thankful for. Even though the dishwasher is sometimes temperamental it is not broken. Rain. We certainly need it. Friends from afar come near again. Isaiah's ambitious and cooperative teachers and therapists. I remembered what else I'm thankful for today. See below. The turning of the seasons. The dance of fallen leaves in eddies of wind. The annual church hayride. It's tomorrow. I hope it isn't too cloudy. I've been talking to Ethan about constellations since he commented about the stars in the sky one night last week in the school parking lot. I sense a trip to the planetarium in our future. On more than one occasion I've had someone imply that I was ignorant or uneducated about something because I did not agree with their conclusions on the matter. Such a presumptuous declaration definitely leaves me with a substantially reduced opinion of a person's intellectual abilities. Actually, I'm beginning to wish that celebrities had never discovered that autism existed. I think we'd all be a lot better off if famous people would just let those of us little people affected by autism speak for ourselves. I certainly wish researchers would be left in peace to explore autism. Instead many are chasing red herrings (you know which ones) or doing sloppy work in an attempt to get at some of the research money being thrown around willy-nilly to find cures and causes for autism. "Now I have to grow a new one." Ethan came downstairs a little while ago looking as if he couldn't decide if he should get upset or not. I watched him stand near the dinning room table looking puzzled and a little anxious. He kept sticking his fingers in his mouth. When I went over to check on him I heard him mumbling, "Now I have to grow a new one." I guessed that he had lost another wobbly tooth. So I asked him where his tooth was. Then he started getting a bit upset and looked around on the floor for it. After a bit he told me that he had swallowed it. I don't know if he actually swallowed the tooth or not but he has no idea where it is and neither do I.
Thankfully Ethan is used to this now so all I had to do to calm him down was to tell him excitedly that now his body was going to grow a new one. Then I had him rinse his mouth out with salt water and I reminded him that he already had a new tooth coming in where his first tooth used to be. Two down, 18 to go. If you haven't read Deathly Hallows yet but still want to be surprised you may want to skip this post. My family and I have been listening to the Harry Potter books on tape. We're currently on Prisoner of AzkabanChamber of Secrets. Yesterday we started the section where Harry goes to the dueling club. Here Harry is first introduced to what later becomes his signature spell by which the Death Eaters are able to identify him. I found it ironic that Harry learned his signature spell,the spell that got him out so many scrapes, from someone he considered to be is nemesis for almost the entirety of the series. Fun with science edition. 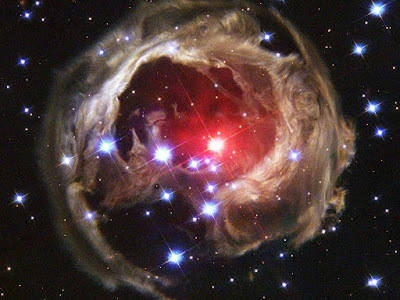 I give you V838 Monocerotis Light Echo. I happen to think it looks like a phoenix or dragon or a bird of prey living in space. Space Phenomenon Imitates Art in Universe's Version of van Gogh Painting"Starry Night," Vincent van Gogh's famous painting, is renowned for its bold whorls of light sweeping across a raging night sky. Although this image of the heavens came only from the artist's restless imagination, a new picture from NASA's Hubble Space Telescope bears remarkable similarities to the van Gogh work, complete with never-before-seen spirals of dust swirling across trillions of miles of interstellar space. Isaiah has so far failed to get himself hit by a car. A good nights sleep for all. Such simple wisdom that adults and children alike need to remember. "Are we watching the dogs?" While I'm painting her nails (she's been pestering me about it for week now) Sophia is watching Discovery Channel. Brittany Spears' "Oops I Did It Again" comes on and I'm wondering why that would be on Discovery Channel. Then Sophia asks me, "Mommy are we watching the dogs?" I glance at the television screen in time to see something about "Our neighbours want to evict us" and then a prairie dog pops up on screen. She apparently recognised the word "dog" but not any of the other words. Not only did Isaiah want sauce on his pasta last night, he actually ate it. He even ate the meat in the sauce. This is a kid who would previously paint the table with his food if we forgot ourselves and put sauce on his pasta. According to his special ed teacher Isaiah is adjusting very well to his new classroom and effectively using his PECS binder to communicate with his teachers and aides. He's still a menace at home but I can live with that. Thanks to many, many, many, many viewings of the movie A Bug's Life over the summer Ethan is going through a budding entomologist phase. He wouldn't stay put at the library yesterday until I mentioned getting some books about bugs. Sophia seems to be the budding botanist in the family. She demands a leaf from every tree she passes. Life is full of trouble enough, you don't need to go looking for more. This is the reason why I don't jump out of moving airplanes, jump off of very tall buildings or rock formations, or otherwise seek thrills. The twists and turns of everyday life is enough to keep me wired. 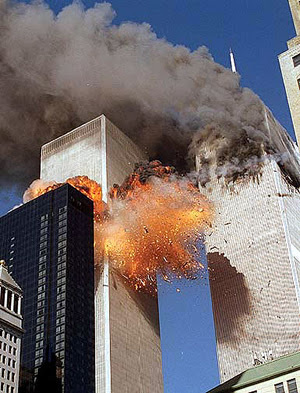 September 11, 2001, Do You Remember? Over the weekend a flier from a local furniture store came in the mail. It seems that they will be having a big clearance sale on September 11 this year. I know Americans have a habit of thoroughly commercializing every holiday and every day of remembrance but isn't it a bit early to be doing this to 9/11? I'm really not interested in remembering those who died that day buy going on a shopping spree. Are you? As I searched for images to include in this post I became unexpectedly emotional. The photo of Father Mychal Judge's body being carried away from ground zero had me sobbing as if I were watching the towers fall for the first time. Father Judge"Out of the wreckage of the south tower, first responders carry the body of Father Mychal Judge, the FDNY chaplain, to St. Peter’s Church. (Photograph by Shannon Stapleton / Reuters)"
posted at Say Anything: Reader Blogs. Mothers always have to take one for their kids. All through out history mothers have been held responsible for the outcome of their children's lives. If anything ever went wrong it was because mom screwed up somewhere. For a very long time it was the official belief of the scientific and medical community that mothers caused autism in their children by not loving them enough. These days I hear people say, with regards to autism, things like, "At least we're not blaming the mothers any more." Actually, we still do and I don't think we ever really stopped. Ethan lost his first tooth while I was out last night. According to hubby it was an uneventful happening. Ethan simply paused in his activity and said something along the lines of, "My wobbly tooth fell out." Neither Ethan nor hubby seem to know how the tooth fell out or where it ended up. They just know that it's not in Ethan's mouth any more. Ethan apparently got very upset that he didn't know where his tooth went. He started talking about going to the store to get a new one. Hubby short circuited his anxiety attack by presenting him with a copy of the Prince of Egypt sound track. (He woke up first thing this morning to blast the music on his radio.) So now I have to go looking for Ethan's tooth. Not only was the school bus not late, it was actually a little early! Usually on the first day of school the bus is at least 15 minutes late. Hair detangling spray for kids. God bless whoever came up with the idea to market the stuff! Lack of eye contact is a big deal to non-autistic people. Especially to therapists, teachers, psychologists, and the like. Living with two autistic children and one autistic adult I've learned to make do without it. I have gotten to the point where I sometimes feel uncomfortable making eye contact myself. In fact recently I've had the experience of finding eye contact to be quite jarring. A bit like staring at a really bright light bulb after being in a dark room. I can't really recall the circumstances that led to this feeling but I do remember the feeling quite vividly. It has happened more than once. Despite trying to prepare Ethan for the inevitable losing of his baby teeth for over a year he just had a total freak out episode when his first lose tooth started bleeding. He was in fine form wailing and flapping his hands in the bathroom. I've never seen him flap his hands that much before. The neighbours got an earful from him (courtesy of the open bathroom window) about how his wobbly tooth was bleeding in his mouth and I had to fix it. He may even have insisted that I go to the store and get a new because the old one was broken. We've watched Prince of Egypt a lot this week. Sophia recently discovered it and keeps asking to watch it. Ethan likes it as well. Every time it starts he takes his shirt off and puts it on his head like the workers in the opening sequence. Then he starts stomping around the room like he's stomping mud in a mud pit. When the chariot race comes up he runs around and around the coffee table saying Moses' and Rameses' lines. He repeatedly rewinds the tape to watch the chariot scene until I stop him and make him watch the rest of the movie. Ethan and Sophia really like the falling into the well bit too. They both hide behind the couch waiting to be pulled out.